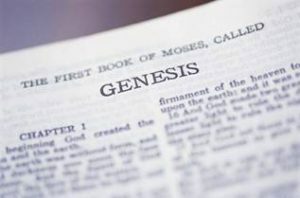 Genesis (Greek: Γένεσις, having the meanings of “birth”, “creation”, “cause”, “beginning”, “source” and “origin”), also called The First Book of Moses, is the first book of Torah (five books of Moses), and is the first book of the Tanakh, part of the Hebrew Bible; it is also the first book of the Christian Old Testament. In Hebrew, it is called בראשׁית (Bereshit or Bərêšîth), after the first word of the text in Hebrew (meaning “in the beginning of”). This is in line with the pattern of naming the other five books of the Pentateuch. In this verse we begin the work of creation in its epitome and in its embryo. The effect produced–the heaven and the earth, that is, the world, including the whole frame and furniture of the universe, the world and all things therein. There are phenomena in nature which cannot be solved, secrets which cannot be fathomed nor accounted for. But from what we see of heaven and earth we may easily enough infer the eternal power and Godhead of the great Creator, and may furnish ourselves with abundant matter for his praises. And let our make and place, as men, remind us of our duty as Christians, which is always to keep heaven in our eye and the earth under our feet. The author and cause of this great work–GOD. The Hebrew word is Elohim, which bespeaks, [1.] The power of God the Creator. El signifies the strong God; and what less than almighty strength could bring all things out of nothing? The manner in which this work was affected: God created it, that is, made it out of nothing. There was not any pre-existent matter out of which the world was produced. When this work was produced: In the beginning, that is, in the beginning of time, when that clock was first set a going: time began with the production of those beings that are measured by time. Before the beginning of time there was none but that Infinite Being that inhabits eternity. Let us learn hence, (1.) That atheism is folly, and atheists are the greatest fools in nature; for they see there is a world that could not make itself, and yet they will not own there is a God that made it. Doubtless, they are without excuse, but the god of this world has blinded their minds. (2.) That God is sovereign Lord of all by an incontestable right. If he is the Creator, no doubt he is the owner and possessor of heaven and earth. (3.) That with God all things are possible, and therefore happy are the people that have him for their God, and whose help and hope stand in his name. (4.) That the God we serve is worthy of, and yet is exalted far above, all blessing and praise. If he made the world, he needs not our services, nor can be benefited by them, and yet he justly requires them, and deserves our praise. If all is of him, all must be to him. What evidence in our world do you see that proves Genesis 1:1? Is this meant to be taken literally or figuratively? Why to atheists have such a hard time with Biblical messages like Genesis 1:1? What do you see happening to mankind if we forget this verse? 19 Now this was John’s testimony when the Jews of Jerusalem sent priests and Levites to ask him who he was. 20 He did not fail to confess, but confessed freely, “I am not the Christ.” 21 They asked him, “Then who are you? Are you Elijah?” He said, “I am not.” “Are you the Prophet?” He answered, “No.” 22 Finally they said, “Who are you? Give us an answer to take back to those who sent us. What do you say about yourself?” 23 John replied in the words of Isaiah the prophet, “I am the voice of one calling in the desert, ‘Make straight the way for the Lord.’ “24 Now some Pharisees who had been sent 25 questioned him, “Why then do you baptize if you are not the Christ, nor Elijah, nor the Prophet?” 26 “I baptize with water,” John replied, “But among you stands one you do not know. 27 He is the one who comes after me, the thongs of whose sandals I am not worthy to untie.” 28 This all happened at Bethany on the other side of the Jordan, where John was baptizing. The Gospel of John is the fourth gospel in the sequence of the canon as printed in the New Testament. Like the other three gospels, it contains an account of the life of Jesus. While some controversy has recently emerged as to the author of this gospel, it is generally agreed to be the Apostle John. Scholars place the gospel anywhere between AD 65 and 85. The text itself states only that the Fourth Gospel was written by an anonymous follower of Jesus referred to as the Beloved Disciple. John would have written this gospel, late in life (90 to 100 years of age), while living in Ephesus. In Matthew’s account, John himself raised the issue and makes clear that he knows who is greater: “I ought to be the one baptized by you.” Luke offers us another perspective, providing the story in which John is destined from before birth to be the prophet for his younger cousin. Matthew tells of Jesus explaining the baptism as a “fulfilling of all righteousness,” and Luke describes the baptism as an occasion of Jesus’ solidarity with others and his devotion to God. The fourth evangelist, however, does not offer an explanation; in fact, he depicts no baptism at all. Instead John the Baptist speaks to the superior authority and divine agency of Jesus. The baptizer does not baptize Jesus but attests to his identity as the Christ and the Lamb of God. “[John] himself was not the light, but he came to testify to the light.” He is explicit both about his own non-messianic status and about the identity of the one who is anointed. Messianic ambitions for ourselves and messianic expectations of others are not just the quaint delusions of people certified as mentally ill. They are found in us and around us as we seek too much from others or wish to be too much to them. In this context we should remember Johns pointing away from himself and to Jesus. We are not, any nor all of us, the Messiah. That position has already been filled. To let Jesus be our Christ, our anointed savior and rescuer must be our goal. In John’s Gospel, this needed humility is worked by focusing on the person of the beloved Jesus, the revelation that he is the Truth and the Way and the Life. He is the light to which both John the Baptist and John the evangelist were sent to testify. In what ways do we, today, forget that we are not the end all, the Messiah? How is the healthy message of humility and servitude to Christ being overwritten by the modern world? In what ways does this attitude creep into the Christian church? How does one practice humility? How does one teach humility? Can we have too much humility? If there is such a thing as a proper balance of appreciation, satisfaction, ego and humility, then how do we know when we have it?